Pakistan and Russia were looking for ways to tackle Islamist militancy and nuclear proliferation at talks on Jan. 24, aimed at overcoming decades of distrust. 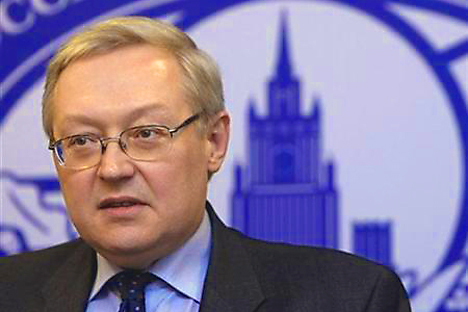 Deputy Foreign Minister Sergei Ryabkov led the Russian side at two-day talks also expected to touch on Afghanistan, where both nations have concerns as the United States prepares to withdraw. "There has been a lot of mistrust between the two countries which has actually ruined their relationship in the past," said Talat Masood, a retired Pakistan army general and a security analyst. "They are trying to get over their past and start a new beginning." During the Cold War, Pakistan was allied with the United States and the Soviet Union backed Pakistan's main rival, India. The two were bitter enemies in the 1980s when Pakistan supported mujahedin guerrillas battling Soviet troops in Afghanistan and also during the Taliban's rule in Afghanistan from 1996 to 2001. Pakistan backed Taliban while Russia, along with Iran and India, supported the Northern Alliance opposition. But ties have warmed since a 2003 visit by Pakistan's then military president, Pervez Musharraf — the first by a Pakistani leader to Russia in 30 years. "The main issues to be discussed at the talks will be nonproliferation, counter-terrorism as well as regional and global security," a Pakistani Foreign Ministry official said. Threat of Islamist militancy, extremism and drug trafficking emanating from the Afghan-Pakistan border region are the main Russian concerns. Moscow suspects that Muslim extremists in Pakistani sanctuaries have links with militants from the North Caucasus. Officials said Pakistan and Russia could cooperate in tracking down militants from Central Asia living in Pakistan's tribal areas on the Afghan border. The two sides may also share ideas on how to tighten command and control of nuclear weapons. Islamabad is interested in Russian investment in its oil and gas sectors as well as in heavy industries, officials said. "These are preliminary and exploratory talks and we will see how can we move forward from here," the Pakistani Foreign Ministry official said. Economic ties have been sporadic over the decades, with the one major project being the construction of a major steel mill in Karachi in the 1970s with the help of the Soviets.